Looks good, doesn't it? 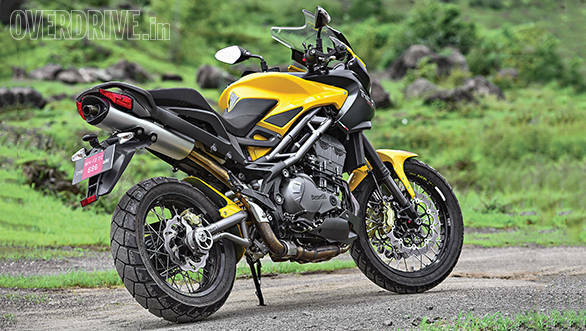 Benelli's newest motorcycle based on their 1,131cc inline triple is this, the Trek Amazonas which was launched in September 2006 as an adventure tourer. 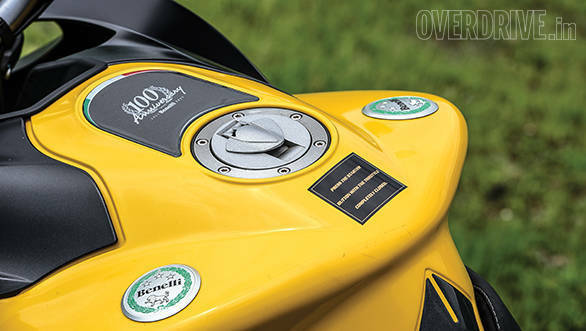 The motorcycle makes the savvy decision to stick with what it knows in terms of design and even if we were to strip the Trek of all badging and decals - a considerable task - you would recognise it as a Benelli. And yes, that does mean that distinctive compound-eyed insect-y front end with those headlights that started out on the TNT. From there, the design follows Benelli's typically busy but careful design that shows up in all the aggregates and looks very nice up close. Step back a bit and there's a lot going on but the effect isn't off-putting and if you run your mind over all the other adventure tourers, the Trek is actually amongst the top lookers across the board. Not bad for a nine-year old design, eh? It isn't just the looks either. 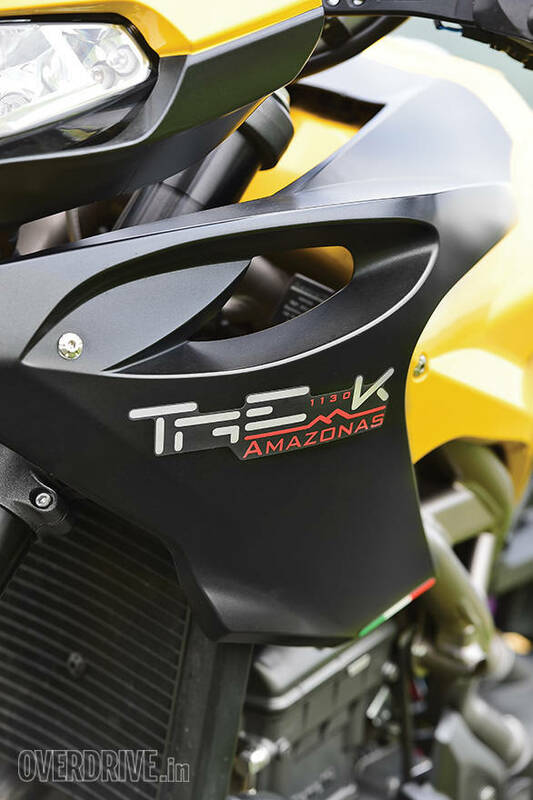 The Trek gets the mildest form of the fuel-injected 1,131cc triple. 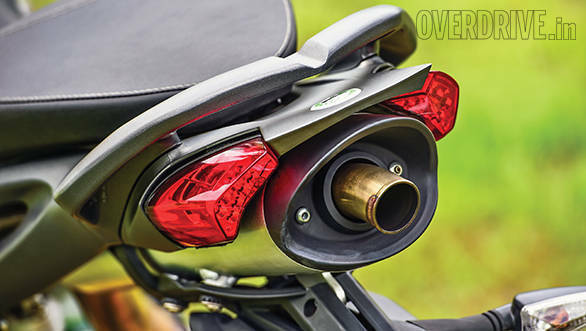 Torque peaks early at 6,250rpm and the peak horsepower arrives at 9,000rpm and 126PS is a fair amount of power. The engine appears to have an extremely light flywheel so the rev rise and drop extremely fast, almost as if the Trek thinks it is a race bike. The engine is hung from a tubular trellis frame that forms twin spars which connect to a very sharp looking set of pivot plates. Tubular extensions are used to hang the engine from the frame. At the back is the usual tubular swingarm with the underslung brace that looks very nice indeed. Suspension? The front is a 50mm Marzocchi upside down fork with rebound and compression adjustment available and at the rear is a mono shock adjustable for preload and rebound made by Extreme Tech. The spoked Excel aluminium rims (19-inch front and 17-inch rear) wear Metzeler Tourance tubeless tyres with a large block tread that signifies a lot of time on tarmac, and a little bit of off-road moonlighting. The electronics are pretty simple. There's a large button on the dash marked 'Power Control' that selects a mild ignition map for slippery conditions or the full-hard map that releases a few extra revs on top and sharpens things up slightly. And that's it. The Benellis are still analogue motorcycles in that sense and there isn't any electro-nannification to discuss at this time. On the flip side, the Trek also doesn't get ABS - neither do any of its other siblings - and I think that's a big miss and something Pesaro/China needs to fix post haste or as I'd put in my bad Italian, molto velocemente. Start the Trek up and it sounds like a Benelli. It clatters to a start with a gruff, almost unhappy voice and then settles into a throaty idle. The sound is much nicer on the move but like all the 1130s, the Trek can easily accommodate a lot more refinement. Unfortunately, as happened with the 899 TNT earlier, our Trek wasn't running right. In fact, this poor Trek is the only one here and it's been through a fair bit. It got dropped in transit to India and then it's been ridden by all manner of people. As a result, this one squeaks and rattles a bit and on our test, the engine didn't feel like it having the best day. Anyhow, riding it was fun. The real surge starts at 4,000rpm and after that, the power is quite linear. I kept waiting for a second intensification of the acceleration but it never really came in either mode. Despite which, the Trek throws big numbers into the wee digital speedo so hard it's disconcerting. You can bet that when the Trek comes for a road test, we will be watching whether the speedo's urgency is optimistic calibration or actual acceleration. But once you get over the numbers fixation, you'll find that the Trek cruises easily at highway speeds and beyond it, feels good. When the corners come up, it remains firmly in its element too. Turn in requires a fair push on the bars but it responds smartly taking up lean steadily while feeling just a little bit tall. I suspect that you'll grow used to the sensation and then be able to fling it around pretty handily in short order. The suspension feels firmly damped but never harsh and the Trek, feels well up to the task of bad-roading or handling a sudden stretch of government ignorance without complaint. 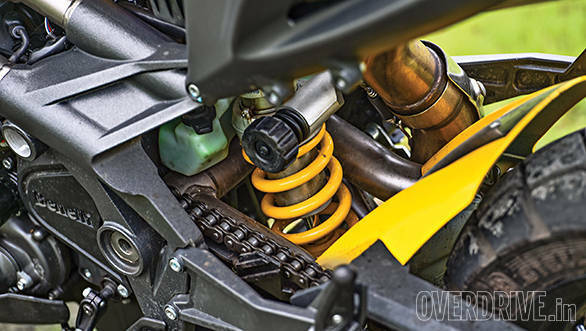 We did try our hand at light off-roading and here the suspension surprised us. The Trek's suspension is actually quite compliant and it handled some pretty large undulations at speed far, far better than I expected. But this light off-roading also exposed an issue - that again could just be our bike. 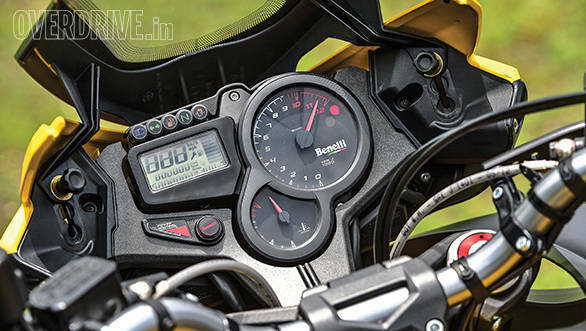 It turns out that at low speeds and low revs, the Benelli is very sensitive, far more so than the Suzuki GSX-S1000 which also had similar issues. But the Trek is too sensitive. It made rolling behind the tracking car at a steady 40-80kmph hard work even as high as third gear and in the dirt, I lit up the rear wheel a lot more than I intended to. The long chassis is pretty good so a spinning rear wheel isn't very scary on the Trek, thankfully. The Trek is a potentially likeable adventure tourer with extremely limited ability off-road. I say that because of many reasons. Top two of those are easy to see. The bash plate isn't. It's just prettification that leaves the bottom exposed. And two, the foot peg design - shared with the TNTs - works well on dry tarmac. 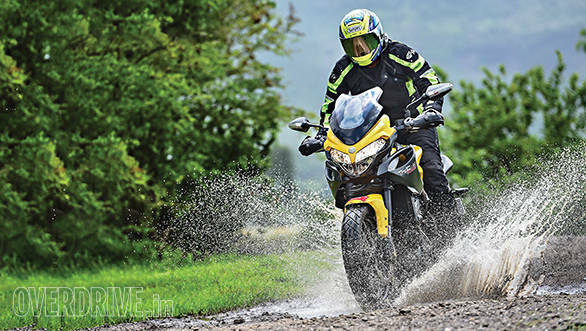 Once it's wet, trying to stand up to handle a bump or pothole will immediately have your boot slip clean off and that quickly ends any confidence in standing up and riding. 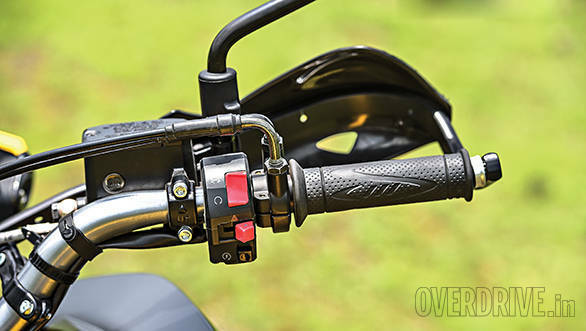 If I bought one, I'd be getting rid of these silly, slippery pegs and get something a lot more functional. But would I buy one? I don't think I have enough information to make that call yet, unfortunately. 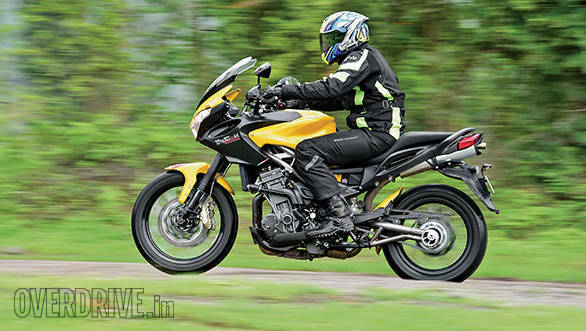 The Benelli is expected to cost about Rs 12.5-13 lakh when it goes on sale shortly and in there, potentially, is a really nice highway machine with excellent mountain road manners. In stock form, running well, a decent rider should be able to handle anything from open highway to a mountain pass on the Trek. But until we test a clean, well-running example, we're just going to go with that we know - looks good, doesn't it?